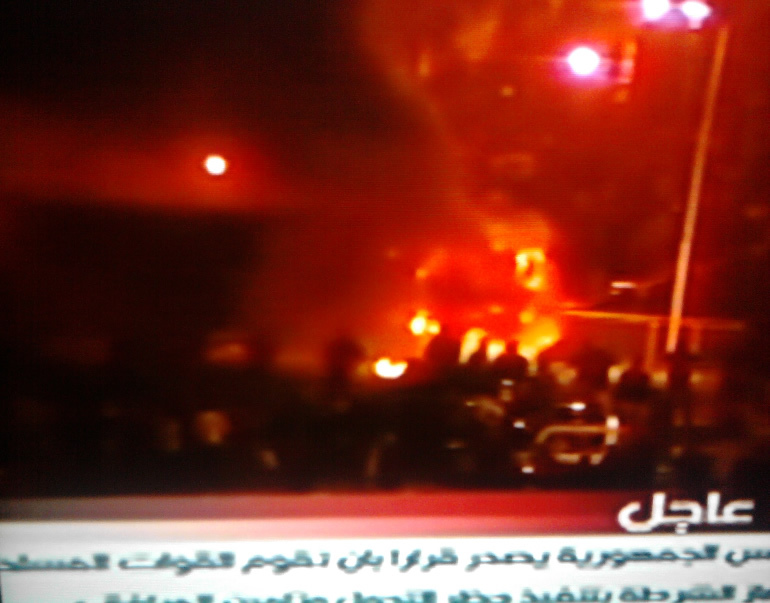 Crowds in Egypt ignore Curfew. International News services are the only way to get information of Egypt as all Internet communications have been cut off. As the world wacthes, a Curfew is extended to the entire country of Egypt. "And so where are we going? Could it be, perhaps, that the Arab world is going to choose its own leaders?" Robert Fisk wrote. Four days of protests in Egypt inspired by the Jasmine Revolution in Tunisia, and referred as a key part of a �domino effect� the movement of the people of Egypt move into their fourth night. Brutal repression, endless tear gas, riot police and arrest are all responded by more massive demonstrations around cities of Egypt. Simultaneous demonstrations spread through out Egypt. CNN reporting meters from the Ministry of Information, reported on what they call �history in the making�, or �scenes never seen before in the history of modern Egypt�. The demonstrators show respect and chant in approval to the military forces which have been mobilized. A curfew was announced and protestors ignored it taking to the streets, as happened in Tunisia. However, Egypt protest which is being referred to as a Revolution is considered massive. The President which demonstrators demand to step down from power will announce the people of Egypt through state television. Experts around the world engage in media conversation of analysis and put forward diverse scenarios. Journalists have been arrested, some have been beaten, reports of police violence on the streets and complete lack of security are followed by Human rights demands of freedom of speech, of assembly and of protest. The Arab world, Europe, US and the rest of the world have their eyes set on Egypt, but it is not only the world leaders and authorities, it is journalists, activists, and the general world public. Hillary Clinton urged the Egypt�s authorities to allow peaceful protest and restrain from violence on both sides. Internet, cell phones, and other means of outside communication have been cut off. Several demands to restore the cut off communications have been made. Robert Fisk writes in a New Truth Dawns on the Arab World. "Across the Arab world � and this does not mean the Muslim world � there is now an understanding of truth that there has not been before." He goes on to say, "It is not possible any more, for the people of the Arab world to lie to each other. The lies are finished. The words of their leaders � which are, unfortunately, our own words � have finished. It is we who have led them into this demise. It is we who have told them these lies. And we cannot recreate them any more." All eyes set on the Egypt, await for the outcome of this unprecedented event. Robert Fisk writes, "And so where are we going? Could it be, perhaps, that the Arab world is going to choose its own leaders?"